I have a small problem that i am facing currently in SharePoint Online. I have two list Employees & Projects and i have created cascading dropdown. When the employee selects its name from employee lookup column he gets to see all his projects in the projects Lookup column. Now the issue that i am facing is that in the lookup i only want to show the logged in employee name so hat he cannot select other users name and fill their entry. is this possible, if yes please do help me. This requires a slight redesign in how you have set up your lists. The first thing you need to do is change your Employee list so that the Employee column is a Person/Group field and Show the field Name. Or you could even just add the Employee field directly into the Project list. This depends on what other uses you have for the Employee list. 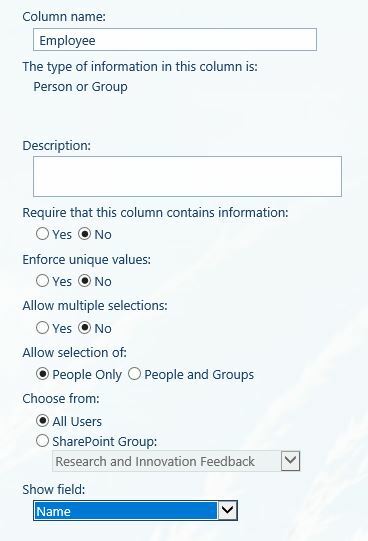 For simplicity I will assume you have added the Employee Person/Group field directly to the Project list. You now need to set up the page to view the projects. Insert the Project list as a web-part and adjust the view to show the columns the way you want to. Now when the page is opened the user will only be able to see the Projects where the Employee field equals the current user. Not the answer you're looking for? Browse other questions tagged lookup-column newform cascading-dropdown or ask your own question.